Bullet Run is a free-to-play FPS that doubles as a rolling 24-hour advertisement for itself. “Boost Your Game!” Is that a thing I want to do? “Go Platinum!” What, why? What's happening? “Buy Weapons! Upgrade Skills! Get Style! Get Station Cash!” Jesus, Bullet Run, calm down. How about you just let me play a game of you? The game's menu is a comically designed bombardment of banners touting cash, credits, style, heat and marketplace items. Bullet Runisn't pay-to-win – every weapon and upgrade can also be unlocked with in-game credits – but it pulls every trick to strongarm you into reaching for your credit card. Weapons and items, whether paid for with cash or credits, are restricted by your rank, which rises as you collect 'fans' (XP). Unless, that is, you get a subscription Platinum membership, which enables you buy anything from Level 1. If you do attempt to earn weapons with credits, be prepared for a long slog. Half of your earnings will be wasted repairing your current guns, which degrade over time. Of course, you could always buy XP boosts – or even cosmetic items, which give style points that grant a bonus to fans. This would all be mightily uncomfortable if Bullet Runwas any good. Luckily, it's a bland collection of half-implemented ideas nicked from other games. Call of Dutyis the most obvious 'inspiration', with its unlock progression and scoring, although Gears of War's active reload system also makes an appearance. 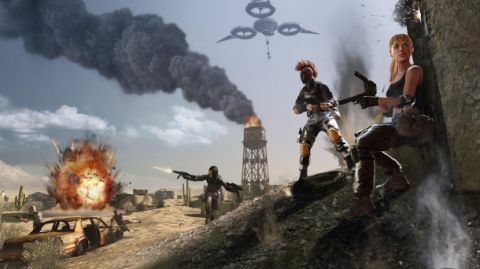 You run around one of five small maps in one of two game types – team deathmatch or the attack/ defence Dominion mode – shooting and being shot at by people. Gain enough Heat from kills and you can deploy one of your four skills. These range from dual-Uzi wielding to deployable turrets or a minigun. Every one needs upgrading (BUY STATION CASH!) to be any good. Each round lasts 15 to 20 minutes, which, when you're mindlessly sprinting through corridors, is too long by about 10 to 15 minutes. It's even too much for the commentary team. The game's conceit is that respawning technology has enabled a reality-TV style deathmatch, but the two commentators were repeating lines before I'd finished my first match. The weapons feel unremarkable due to their lack of feedback or power. Combined with a noticeable and persistent lag problem, that makes for an unrewarding experience. There's simply no excitement, no fun, to the combat. That's a problem when you want people to buy new guns.